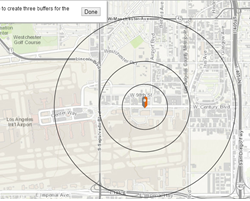 Buffer Map Tool: Generate a buffer from a selected location on the map. Line Chart Widget: Create a line chart powered by data from your map or external data source. List Widget: Use a data source, and display the data in a list. Scatter Plot Widget: Use a specific data source to configure the widget, and display the data in the form of a scatter plot. Table Widget: Display data in a tabular format. Table with Configuration Widget: Use a specific data source to configure the widget, and display the data in a tabular format. GeoEnrichment Widget: Use a GeoEnrichment service to show population by age groups on the map. 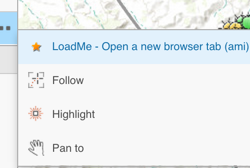 Use the widget to launch a custom map toolbar that can be used to interact with the map, and display the results. 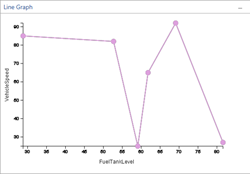 Elevation Profile Widget: Create profile graphs by drawing lines interactively on the map. Portal URL Widget: A widget that shows the currently signed in user and their role in the organization. Export CSV Feature Action: Use a feature action that exports the results into a CSV table. Browser Feature Action: Implement a feature action that, once activated, opens a browser window and displays the website.